I found this written in a book about learning to take care of donkeys. This book I bought in 2001 when my first donkeys, Grischko and Caesar, moved into my life. At that time I was amused, did not know yet that the two burritos not only be great companions on my trips, but also followers of my way of life. In May 2003, together with the two long ears, we walked the Camino de Santiago, from Switzerland to Santiago de Compostela in Spain. We did approximately 2’400 kilometer in four and a half months. Healthy and happy, full of lived adventures and many positive experiences we arrived to our destination. Along the way, was born the idea of preparing and offering hiking trails with donkeys. To share and enjoy these experiences with others; over the years this idea grew into reality. 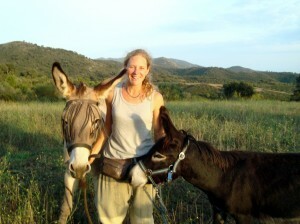 In Spain, in northern Catalonia I found for the hiking with donkeys an ideal destination. In this region, the Pyrenees reach the Mediterranean Sea, you find a big diversity of landscapes, ecosystems, wildlife and flora. Those characteristics form a beautiful backstage for a wide range of hiking opportunities. The mild and relatively dry climate makes it possible to make activities with donkeys all year around. Hiking in the wild nature with a four-legged friend, beautiful sceneries, enjoying the tranquillity of the donkey, forget about the time and the worries of daily life and make unexpected adventures you will never forget … for me these are the things that make hiking with donkeys a great experience and the experience I want to convey.